When I moved into this building at 275 Fifth Avenue, I noticed one of the names on the mailbox was renowned photographer Cornell Capa. Cornell Founded the International Center of Photography (ICP) and celebrated member of Magnum Photos. Also on the mailbox was Cornell's brother Robert Capa, the famous war photojournalist. I lived in the building with Cornell and his wife Edie. We developed a close relationship as he became my mentor and guide. Henri Cartier-Bresson was a frequent visitor to this building, as he and Cornell Capa were close friends. Cartier-Bresson was also a member of Magnum Photos, a collective of the world’s premier photo journalists. 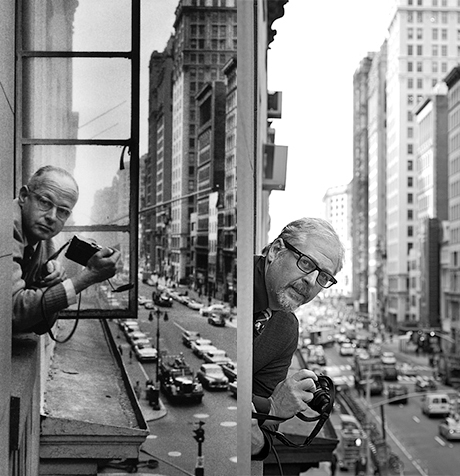 Pictured below (left to right) Henri Cartier-Bresson Looking out the window of Cornell Capa's apartment in 1959 (Photo Credit: Magnum Photos); and Michael Benabib looking out that same window in 2017.